I recently had a special request from a friend that was on a previous design team that we both belonged to, to participate in their wonderful blog as a guest designer. I hadn't posted in a long time, but this was just the push I needed to get back into something I love, so here it is. 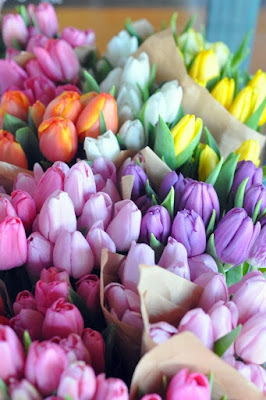 For me tulips mean spring has arrived, and along with tulips the daffodils also pop up there lovely heads to welcome the new season. Stamping Bella has a wonderful new image that was released recently entitled "Tiny Townie Garden Girl Daffodil" that I just had to color. I colored the image with Copic sketch markers, and then cut it out with a Spellbinder die. The edges on the die cut were inked with Tattered Rose Distress Ink and then the points were highlighted with yellow stickle glue. The background paper is a beautiful print from Blue Fern Studios that I tore the edges of, and then inked the edges with the same Tattered Rose ink pad. The lace, that features butterflies was purchased from a local fabric store, cream seam binding, and flowers from Wild Orchid Flowers finish off the card front. The sentiment is an oldie from Whimsy Stamps. So happy to see you posting again! 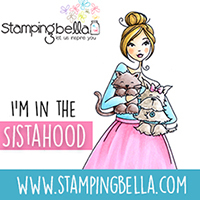 I love all these Stamping Bella images - and as always, your colouring is amazing :o) Thanks for being our wonderful GD this week! Congratulations on being featured at Inspired By All the Little Things! Your card is super sweet! Welcome as our guest this week!!! Your card is is sweet and gorgeous! That Stamping Bella image is perfect for this inspiration. I love your sweet card. Congrats on guest designing for Inspired By this week!